Delegations in Cairo at loggerheads over return of Lt. Hadar Goldin and Sgt. Oron Shaul's bodies; Hamas sticks to sea and airport demand. 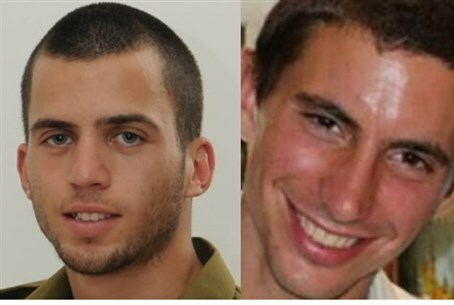 As truce talks head into their final day Wednesday ahead of the end of the ceasefire at midnight, reports reveal that the Palestinian Authority (PA) and Hamas delegation in Cairo is refusing to return the bodies of two IDF soldiers killed in Operation Protective Edge. Israel is refusing to any truce agreement that would not include the return of the bodies of Second Lt.Hadar Goldin and First Sgt. Oron Shaul, reports Channel 10 according to sources in the London-based Asharq Al-Aswat. However, the PA and Hamas delegation is reportedly refusing to discuss the issue, demanding the release of terrorists jailed in Israel. The delegation also reportedly is sticking to its demand for a sea and airport in Gaza; reportedly there is no progress on these issues, or on the demand for passage from Gaza to Judea and Samaria. The Israeli delegation decided to forego its demand that the Hamas terror enclave of Gaza be demilitarized according to the report, and further agreed to ease the passage of Gaza residents, goods and money in and out of Gaza. Prime Minister Binyamin Netanyahu reportedly tried Tuesday to "soften" his coalition partners to such concessions, including that of Israel paying the salaries of Hamas officials in Gaza. However, Foreign Minister Avigdor Liberman on Monday expressed his opposition to letting "terror pay," and specifically referenced the return of the bodies of Goldin and Shaul as being essential before the end of the operation. "It's unthinkable that all Hamas members, including 20,000 of the terrorists in Hamas's military wing, will receive their salaries in an orderly fashion, through the Palestinian Authority or any other way, while the bodies of IDF soldiers still have not received a proper burial in Israel," remarked Liberman.